Hasan Ibn al-Haytham (Latinized Alhazen /ˌælˈhɑːzən/; full name Abū ʿAlī al-Ḥasan ibn al-Ḥasan ibn al-Haytham أبو علي، الحسن بن الحسن بن الهيثم; c. 965 – c. 1040) was an Arab mathematician, astronomer, and physicist of the Islamic Golden Age. Sometimes called “the father of modern optics”, he made significant contributions to the principles of optics and visual perception in particular, his most influential work being his Kitāb al-Manāẓir (كتاب المناظر, “Book of Optics”), written during 1011–1021, which survived in the Latin edition. A polymath, he also wrote on philosophy, theology and medicine. Ibn al-Haytham was the first to explain that vision occurs when light bounces on an object and then is directed to one’s eyes. And he was the first to point out that vision occurs in the brain, rather than in the eyes. He was also an early proponent of the concept that a hypothesis must be proved by experiments based on confirmable procedures or mathematical evidence—hence understanding the scientific method five centuries before Renaissance scientists. Born in Basra, he spent most of his productive period in the Fatimid capital of Cairo and earned his living authoring various treatises and tutoring members of the nobilities.Ibn al-Haytham is sometimes given the byname al-Baṣrī after his birthplace, or al-Miṣrī (“of Egypt”).Ibn al-Haytham was nicknamed the “Second Ptolemy” by Abu’l-Hasan Bayhaqi and the “The Physicist” by John Peckham. 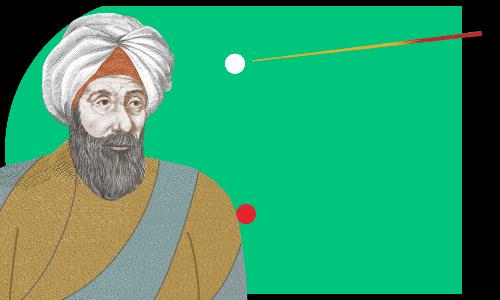 Ibn al-Haytham paved the way for the modern science of physical optics. Among his students were Sorkhab (Sohrab), a Persian from Semnan, and Abu al-Wafa Mubashir ibn Fatek, an Egyptian prince. Alhazen’s most famous work is his seven-volume treatise on optics Kitab al-Manazir (Book of Optics), written from 1011 to 1021. Optics was translated into Latin by an unknown scholar at the end of the 12th century or the beginning of the 13th century. It was printed by Friedrich Risner in 1572, with the title Opticae thesaurus: Alhazeni Arabis libri septem, nuncprimum editi; Eiusdem liber De Crepusculis et nubium ascensionibus (English : Thesaurus of Optics: seven books of the Arab Alhazeni, first edition: concerning twilight and the advancement of clouds). Risner is also the author of the name variant “Alhazen”; before Risner he was known in the west as Alhacen. This work enjoyed a great reputation during the Middle Ages. Works by Alhazen on geometric subjects were discovered in the Bibliothèque nationale in Paris in 1834 by E. A. Sedillot. In all, A. Mark Smith has accounted for 18 full or near-complete manuscripts, and five fragments, which are preserved in 14 locations, including one in the Bodleian Library at Oxford, and one in the library of Bruges. Front page of the Opticae Thesaurus, which included the first printed Latin translation of Alhazen’s Book of Optics. 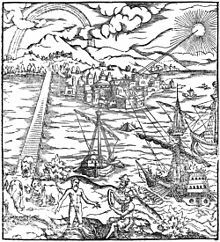 The illustration incorporates many examples of optical phenomena including perspective effects, the rainbow, mirrors, and refraction. Two major theories on vision prevailed in classical antiquity. The first theory, the emission theory, was supported by such thinkers as Euclid and Ptolemy, who believed that sight worked by the eye emitting rays of light. The second theory, the intromission theory supported by Aristotle and his followers, had physical forms entering the eye from an object. 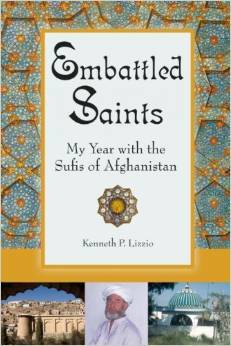 Previous Islamic writers (such as al-Kindi) had argued essentially on Euclidean, Galenist, or Aristotelian lines. 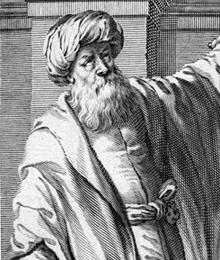 The strongest influence on the Book of Optics was from Ptolemy’s Optics, while the description of the anatomy and physiology of the eye was based on Galen’s account.Alhazen’s achievement was to come up with a theory that successfully combined parts of the mathematical ray arguments of Euclid, the medical tradition of Galen, and the intromission theories of Aristotle. Alhazen’s intromission theory followed al-Kindi (and broke with Aristotle) in asserting that “from each point of every colored body, illuminated by any light, issue light and color along every straight line that can be drawn from that point”.This however left him with the problem of explaining how a coherent image was formed from many independent sources of radiation; in particular, every point of an object would send rays to every point on the eye. What Alhazen needed was for each point on an object to correspond to one point only on the eye. He attempted to resolve this by asserting that the eye would only perceive perpendicular rays from the object—for any one point on the eye, only the ray that reached it directly, without being refracted by any other part of the eye, would be perceived. He argued, using a physical analogy, that perpendicular rays were stronger than oblique rays: in the same way that a ball thrown directly at a board might break the board, whereas a ball thrown obliquely at the board would glance off, perpendicular rays were stronger than refracted rays, and it was only perpendicular rays which were perceived by the eye. As there was only one perpendicular ray that would enter the eye at any one point, and all these rays would converge on the centre of the eye in a cone, this allowed him to resolve the problem of each point on an object sending many rays to the eye; if only the perpendicular ray mattered, then he had a one-to-one correspondence and the confusion could be resolved. He later asserted (in book seven of the Optics) that other rays would be refracted through the eye and perceived as if perpendicular. His arguments regarding perpendicular rays do not clearly explain why only perpendicular rays were perceived; why would the weaker oblique rays not be perceived more weakly?His later argument that refracted rays would be perceived as if perpendicular does not seem persuasive. However, despite its weaknesses, no other theory of the time was so comprehensive, and it was enormously influential, particularly in Western Europe. Directly or indirectly, his De Aspectibus (Book of Optics) inspired much activity in optics between the 13th and 17th centuries. 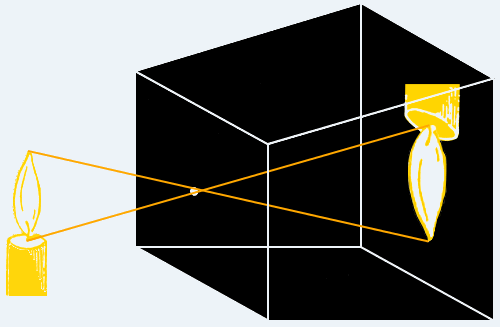 Kepler’s later theory of the retinal image (which resolved the problem of the correspondence of points on an object and points in the eye) built directly on the conceptual framework of Alhazen. Alhazen showed through experiment that light travels in straight lines, and carried out various experiments with lenses, mirrors, refraction, and reflection. His analyses of reflection and refraction considered the vertical and horizontal components of light rays separately. The camera obscura was known to the ancient Chinese, and was described by the Han Chinese polymathic genius Shen Kuo in his scientific book Dream Pool Essays, published in the year 1088 C.E. Aristotle had discussed the basic principle behind it in his Problems, but Alhazen’s work also contained the first clear description, outside of China, of camera obscura in the areas of the middle east, Europe, Africa and India. and early analysis of the device. Alhazen studied the process of sight, the structure of the eye, image formation in the eye, and the visual system. Ian P. Howard argued in a 1996 Perception article that Alhazen should be credited with many discoveries and theories previously attributed to Western Europeans writing centuries later. For example, he described what became in the 19th century Hering’s law of equal innervation. He wrote a description of vertical horopters 600 years before Aguilonius that is actually closer to the modern definition than Aguilonius’s—and his work on binocular disparity was repeated by Panum in 1858. Craig Aaen-Stockdale, while agreeing that Alhazen should be credited with many advances, has expressed some caution, especially when considering Alhazen in isolation from Ptolemy, with whom Alhazen was extremely familiar. Alhazen corrected a significant error of Ptolemy regarding binocular vision, but otherwise his account is very similar; Ptolemy also attempted to explain what is now called Hering’s law. In general, Alhazen built on and expanded the optics of Ptolemy. In a more detailed account of Ibn al-Haytham’s contribution to the study of binocular vision based on Lejeune and Sabra, Raynaud showed that the concepts of correspondence, homonymous and crossed diplopia were in place in Ibn al-Haytham’s optics. But contrary to Howard, he explained why Ibn al-Haytham did not give the circular figure of the horopter and why, by reasoning experimentally, he was in fact closer to the discovery of Panum’s fusional area than that of the Vieth-Müller circle. In this regard, Ibn al-Haytham’s theory of binocular vision faced two main limits: the lack of recognition of the role of the retina, and obviously the lack of an experimental investigation of ocular tracts. Alhazen’s most original contribution was that, after describing how he thought the eye was anatomically constructed, he went on to consider how this anatomy would behave functionally as an optical system. His understanding of pinhole projection from his experiments appears to have influenced his consideration of image inversion in the eye,which he sought to avoid.He maintained that the rays that fell perpendicularly on the lens (or glacial humor as he called it) were further refracted outward as they left the glacial humor and the resulting image thus passed upright into the optic nerve at the back of the eye. He followed Galen in believing that the lens was the receptive organ of sight, although some of his work hints that he thought the retina was also involved. Alhazen’s synthesis of light and vision adhered to the Aristotelian scheme, exhaustively describing the process of vision in a logical, complete fashion. The duty of the man who investigates the writings of scientists, if learning the truth is his goal, is to make himself an enemy of all that he reads, and … attack it from every side. He should also suspect himself as he performs his critical examination of it, so that he may avoid falling into either prejudice or leniency. An aspect associated with Alhazen’s optical research is related to systemic and methodological reliance on experimentation (i’tibar)(Arabic: إعتبار) and controlled testing in his scientific inquiries. Moreover, his experimental directives rested on combining classical physics (ilm tabi’i) with mathematics (ta’alim; geometry in particular). This mathematical-physical approach to experimental science supported most of his propositions in Kitab al-Manazir (The Optics; De aspectibus or Perspectivae)and grounded his theories of vision, light and colour, as well as his research in catoptrics and dioptrics(the study of the reflection and refraction of light, respectively). According to Matthias Schramm, Alhazen “was the first to make a systematic use of the method of varying the experimental conditions in a constant and uniform manner, in an experiment showing that the intensity of the light-spot formed by the projection of the moonlight through two small apertures onto a screen diminishes constantly as one of the apertures is gradually blocked up.”G. J. Toomer expressed some skepticism regarding Schramm’s view, arguing that caution is needed to avoid reading anachronistically particular passages in Alhazen’s very large body of work, because at the time (1964), his Book of Optics had not yet been fully translated from Arabic. While acknowledging Alhazen’s importance in developing experimental techniques, Toomer argued that Alhazen should not be considered in isolation from other Islamic and ancient thinkers. Toomer does concede that “Schramm sums up [Alhazen’s] achievement in the development of scientific method.” Toomer 1964 lists, as a precondition, what is needed for historians to investigate Schramm’s claim (1963) that Ibn al-Haytham was the true founder of modern physics, is translations of Ibn al-Haytham. Mark Smith recounts Alhazen’s elaboration of Ptolemy’s experiments in double vision, reflection, and refraction: Alhazen’s Optics book influenced the Perspectivists in Europe, Roger Bacon, Witelo, and Peckham. The Optics was incorporated into Risner’s 1572 printing of Opticae Thesaurus, through which Kepler finally resolved the contradictions inherent in Witelo’s explanation of the imaging chain, from external object to the retina of the eye. His work on catoptrics in Book V of the Book of Optics contains a discussion of what is now known as Alhazen’s problem, first formulated by Ptolemy in 150 AD. It comprises drawing lines from two points in the plane of a circle meeting at a point on the circumference and making equal angles with the normal at that point. This is equivalent to finding the point on the edge of a circular billiard table at which a player must aim a cue ball at a given point to make it bounce off the table edge and hit another ball at a second given point. Thus, its main application in optics is to solve the problem, “Given a light source and a spherical mirror, find the point on the mirror where the light will be reflected to the eye of an observer.” This leads to an equation of the fourth degree.This eventually led Alhazen to derive a formula for the sum of fourth powers, where previously only the formulas for the sums of squares and cubes had been stated. His method can be readily generalized to find the formula for the sum of any integral powers, although he did not himself do this (perhaps because he only needed the fourth power to calculate the volume of the paraboloid he was interested in). He used his result on sums of integral powers to perform what would now be called an integration, where the formulas for the sums of integral squares and fourth powers allowed him to calculate the volume of a paraboloid. Alhazen eventually solved the problem using conic sections and a geometric proof. His solution was extremely long and complicated and may not have been understood by mathematicians reading him in Latin translation. Later mathematicians used Descartes’ analytical methods to analyse the problem, with a new solution being found in 1997 by the Oxford mathematician Peter M. Neumann. Recently, Mitsubishi Electric Research Laboratories (MERL) researchers Amit Agrawal, Yuichi Taguchi and Srikumar Ramalingam solved the extension of Alhazen’s problem to general rotationally symmetric quadric mirrors including hyperbolic, parabolic and elliptical mirrors. They showed that the mirror reflection point can be computed by solving an eighth degree equation in the most general case. If the camera (eye) is placed on the axis of the mirror, the degree of the equation reduces to six.Alhazen’s problem can also be extended to multiple refractions from a spherical ball. Given a light source and a spherical ball of certain refractive index, the closest point on the spherical ball where the light is refracted to the eye of the observer can be obtained by solving a tenth degree equation. Hevelius’s Selenographia, showing Alhasen representing reason, and Galileo representing the senses. The Kitab al-Manazir (Book of Optics) describes several experimental observations that Alhazen made and how he used his results to explain certain optical phenomena using mechanical analogies. He conducted experiments with projectiles and concluded that only the impact of perpendicular projectiles on surfaces was forceful enough to make them penetrate, whereas surfaces tended to deflect oblique projectile strikes. For example, to explain refraction from a rare to a dense medium, he used the mechanical analogy of an iron ball thrown at a thin slate covering a wide hole in a metal sheet. A perpendicular throw breaks the slate and passes through, whereas an oblique one with equal force and from an equal distance does not.He also used this result to explain how intense, direct light hurts the eye, using a mechanical analogy: Alhazen associated ‘strong’ lights with perpendicular rays and ‘weak’ lights with oblique ones. The obvious answer to the problem of multiple rays and the eye was in the choice of the perpendicular ray, since only one such ray from each point on the surface of the object could penetrate the eye. Sudanese psychologist Omar Khaleefa has argued that Alhazen should be considered the founder of experimental psychology, for his pioneering work on the psychology of visual perception and optical illusions. Khaleefa has also argued that Alhazen should also be considered the “founder of psychophysics”, a sub-discipline and precursor to modern psychology. Although Alhazen made many subjective reports regarding vision, there is no evidence that he used quantitative psychophysical techniques and the claim has been rebuffed. Alhazen offered an explanation of the Moon illusion, an illusion that played an important role in the scientific tradition of medieval Europe. Many authors repeated explanations that attempted to solve the problem of the Moon appearing larger near the horizon than it does when higher up in the sky. Alhazen argued against Ptolemy’s refraction theory, and defined the problem in terms of perceived, rather than real, enlargement. He said that judging the distance of an object depends on there being an uninterrupted sequence of intervening bodies between the object and the observer. When the Moon is high in the sky there are no intervening objects, so the Moon appears close. The perceived size of an object of constant angular size varies with its perceived distance. Therefore, the Moon appears closer and smaller high in the sky, and further and larger on the horizon. Through works by Roger Bacon, John Pecham and Witelo based on Alhazen’s explanation, the Moon illusion gradually came to be accepted as a psychological phenomenon, with the refraction theory being rejected in the 17th century.Although Alhazen is often credited with the perceived distance explanation, he was not the first author to offer it. Cleomedes (c. 2nd century) gave this account (in addition to refraction), and he credited it to Posidonius (c. 135–50 BC). Ptolemy may also have offered this explanation in his Optics, but the text is obscure.Alhazen’s writings were more widely available in the Middle Ages than those of these earlier authors, and that probably explains why Alhazen received the credit. Besides the Book of Optics, Alhazen wrote several other treatises on the same subject, including his Risala fi l-Daw’ (Treatise on Light). He investigated the properties of luminance, the rainbow, eclipses, twilight, and moonlight. Experiments with mirrors and the refractive interfaces between air, water, and glass cubes, hemispheres, and quarter-spheres provided the foundation for his theories on catoptrics. Alhazen discussed the physics of the celestial region in his Epitome of Astronomy, arguing that Ptolemaic models must be understood in terms of physical objects rather than abstract hypotheses—in other words that it should be possible to create physical models where (for example) none of the celestial bodies would collide with each other. The suggestion of mechanical models for the Earth centred Ptolemaic model “greatly contributed to the eventual triumph of the Ptolemaic system among the Christians of the West”. Alhazen’s determination to root astronomy in the realm of physical objects was important, however, because it meant astronomical hypotheses “were accountable to the laws of physics”, and could be criticised and improved upon in those terms. He also wrote Maqala fi daw al-qamar (On the Light of the Moon). In his work, Alhazen discussed theories on the motion of a body. In his Treatise on Place, Alhazen disagreed with Aristotle’s view that nature abhors a void, and he used geometry in an attempt to demonstrate that place (al-makan) is the imagined three-dimensional void between the inner surfaces of a containing body. The earth as a whole is a round sphere whose center is the center of the world. It is stationary in its [the world’s] middle, fixed in it and not moving in any direction nor moving with any of the varieties of motion, but always at rest. The book is a non-technical explanation of Ptolemy’s Almagest, which was eventually translated into Hebrew and Latin in the 13th and 14th centuries and subsequently had an influence on astronomers such as Georg von Peuerbach during the European Middle Ages and Renaissance. Ptolemy assumed an arrangement (hay’a) that cannot exist, and the fact that this arrangement produces in his imagination the motions that belong to the planets does not free him from the error he committed in his assumed arrangement, for the existing motions of the planets cannot be the result of an arrangement that is impossible to exist… [F]or a man to imagine a circle in the heavens, and to imagine the planet moving in it does not bring about the planet’s motion. He held that the criticism of existing theories—which dominated this book—holds a special place in the growth of scientific knowledge. Alhazen’s The Model of the Motions of Each of the Seven Planets was written c. 1038. Only one damaged manuscript has been found, with only the introduction and the first section, on the theory of planetary motion, surviving. (There was also a second section on astronomical calculation, and a third section, on astronomical instruments.) Following on from his Doubts on Ptolemy, Alhazen described a new, geometry-based planetary model, describing the motions of the planets in terms of spherical geometry, infinitesimal geometry and trigonometry. He kept a geocentric universe and assumed that celestial motions are uniformly circular, which required the inclusion of epicycles to explain observed motion, but he managed to eliminate Ptolemy’s equant. In general, his model didn’t try to provide a causal explanation of the motions, but concentrated on providing a complete, geometric description that could explain observed motions without the contradictions inherent in Ptolemy’s model. 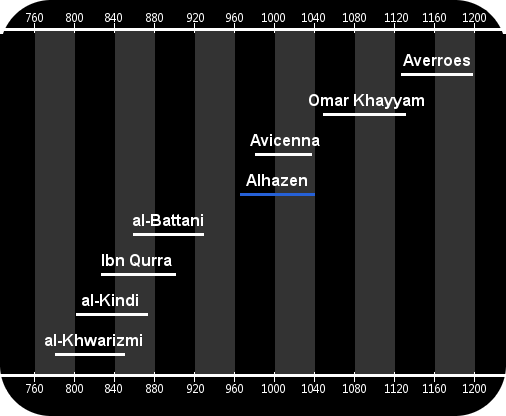 Alhazen wrote a total of twenty-five astronomical works, some concerning technical issues such as Exact Determination of the Meridian, a second group concerning accurate astronomical observation, a third group concerning various astronomical problems and questions such as the location of the Milky Way; Alhazen argued for a distant location, based on the fact that it does not move in relation to the fixed stars. The fourth group consists of ten works on astronomical theory, including the Doubts and Model of the Motions discussed above. He developed a formula for summing the first 100 natural numbers, using a geometric proof to prove the formula. The lunes of Alhazen. The two blue lunes together have the same area as the green right triangle. Alhazen explored what is now known as the Euclidean parallel postulate, the fifth postulate in Euclid’s Elements, using a proof by contradiction,and in effect introducing the concept of motion into geometry.He formulated the Lambert quadrilateral, which Boris Abramovich Rozenfeld names the “Ibn al-Haytham–Lambert quadrilateral”. In elementary geometry, Alhazen attempted to solve the problem of squaring the circle using the area of lunes (crescent shapes), but later gave up on the impossible task. The two lunes formed from a right triangle by erecting a semicircle on each of the triangle’s sides, inward for the hypotenuse and outward for the other two sides, are known as the lunes of Alhazen; they have the same total area as the triangle itself. Alhazen’s contributions to number theory include his work on perfect numbers. In his Analysis and Synthesis, he may have been the first to state that every even perfect number is of the form 2n−1(2n − 1) where 2n − 1 is prime, but he was not able to prove this result; Euler later proved it in the 18th century. Alhazen solved problems involving congruences using what is now called Wilson’s theorem. In his Opuscula, Alhazen considers the solution of a system of congruences, and gives two general methods of solution. His first method, the canonical method, involved Wilson’s theorem, while his second method involved a version of the Chinese remainder theorem. Alhazen also wrote a Treatise on the Influence of Melodies on the Souls of Animals, although no copies have survived. It appears to have been concerned with the question of whether animals could react to music, for example whether a camel would increase or decrease its pace. In engineering, one account of his career as a civil engineer has him summoned to Egypt by the Fatimid Caliph, Al-Hakim bi-Amr Allah, to regulate the flooding of the Nile River. He carried out a detailed scientific study of the annual inundation of the Nile River, and he drew plans for building a dam, at the site of the modern-day Aswan Dam. His field work, however, later made him aware of the impracticality of this scheme, and he soon feigned madness so he could avoid punishment from the Caliph. In his Treatise on Place, Alhazen disagreed with Aristotle’s view that nature abhors a void, and he used geometry in an attempt to demonstrate that place (al-makan) is the imagined three-dimensional void between the inner surfaces of a containing body.Abd-el-latif, a supporter of Aristotle’s philosophical view of place, later criticized the work in Fi al-Radd ‘ala Ibn al-Haytham fi al-makan (A refutation of Ibn al-Haytham’s place) for its geometrization of place. Alhazen was a Muslim; it is not certain to which school of Islam he belonged. As a Sunni, he may have been either a follower of the Ash’ari school, or a follower of the Mu’tazili school.Sabra (1978) even suggested he might have been an adherent of Shia Islam. Alhazen wrote a work on Islamic theology in which he discussed prophethood and developed a system of philosophical criteria to discern its false claimants in his time.He also wrote a treatise entitled Finding the Direction of Qibla by Calculation in which he discussed finding the Qibla, where prayers (salat) are directed towards, mathematically. From the statements made by the noble Shaykh, it is clear that he believes in Ptolemy’s words in everything he says, without relying on a demonstration or calling on a proof, but by pure imitation (taqlid); that is how experts in the prophetic tradition have faith in Prophets, may the blessing of God be upon them. But it is not the way that mathematicians have faith in specialists in the demonstrative sciences. Alhazen made significant contributions to optics, number theory, geometry, astronomy and natural philosophy. Alhazen’s work on optics is credited with contributing a new emphasis on experiment. His main work, Kitab al-Manazir (Book of Optics), was known in the Muslim world mainly, but not exclusively, through the thirteenth-century commentary by Kamāl al-Dīn al-Fārisī, the Tanqīḥ al-Manāẓir li-dhawī l-abṣār wa l-baṣā’ir. In al-Andalus, it was used by the eleventh-century prince of the Banu Hud dynasty of Zaragossa and author of an important mathematical text, al-Mu’taman ibn Hūd. A Latin translation of the Kitab al-Manazir was made probably in the late twelfth or early thirteenth century. This translation was read by and greatly influenced a number of scholars in Christian Europe including: Roger Bacon,Robert Grosseteste, Witelo, Giambattista della Porta, Leonardo Da Vinci, Galileo Galilei, Christiaan Huygens,René Descartes,and Johannes Kepler. His research in catoptrics (the study of optical systems using mirrors) centred on spherical and parabolic mirrors and spherical aberration. He made the observation that the ratio between the angle of incidence and refraction does not remain constant, and investigated the magnifying power of a lens. His work on catoptrics also contains the problem known as “Alhazen’s problem”.Meanwhile in the Islamic world, Alhazen’s work influenced Averroes’ writings on optics, and his legacy was further advanced through the ‘reforming’ of his Optics by Persian scientist Kamal al-Din al-Farisi (died c. 1320) in the latter’s Kitab Tanqih al-Manazir (The Revision of [Ibn al-Haytham’s] Optics).Alhazen wrote as many as 200 books, although only 55 have survived. Some of his treatises on optics survived only through Latin translation. During the Middle Ages his books on cosmology were translated into Latin, Hebrew and other languages. The impact crater Alhazen on the Moon is named in his honour, as was the asteroid 59239 Alhazen. In honour of Alhazen, the Aga Khan University (Pakistan) named its Ophthalmology endowed chair as “The Ibn-e-Haitham Associate Professor and Chief of Ophthalmology”. Alhazen, by the name Ibn al-Haytham, is featured on the obverse of the Iraqi 10,000-dinar banknote issued in 2003,and on 10-dinar notes from 1982. The 2015 International Year of Light celebrated the 1000th anniversary of the works on optics by Ibn Al-Haytham. After the death of Archimedes no really great physicist appeared until Ibn al-Haytham. If, therefore, we confine our interest only to the history of physics, there is a long period of over twelve hundred years during which the Golden Age of Greece gave way to the era of Muslim Scholasticism, and the experimental spirit of the noblest physicist of Antiquity lived again in the Arab Scholar from Basra. 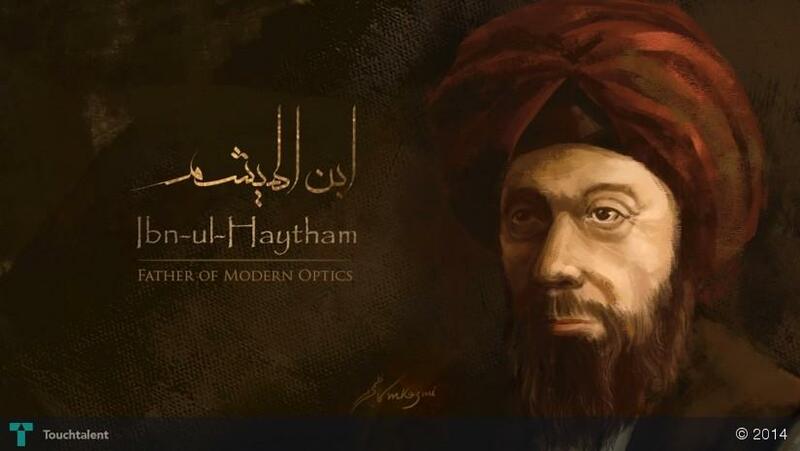 UNESCO declared 2015 the International Year of Light and its Director-General Irina Bokova dubbed Ibn al-Haytham ‘the father of optics’. Amongst others, this was to celebrate Ibn Al-Haytham’s achievements in optics, mathematics and astronomy. An international campaign, created by the 1001 Inventions organisation, titled 1001 Inventions and the World of Ibn Al-Haytham featuring a series of interactive exhibits, workshops and live shows about his work, partnering with science centers, science festivals, museums, and educational institutions, as well as digital and social media platforms. The campaign also produced and released the short educational film 1001 Inventions and the World of Ibn Al-Haytham. Smith (2010) has noted that Alhazen’s treatment of refraction describes an experimental setup without publication of data. Ptolemy published his experimental results for refraction, in contrast. According to medieval biographers, Alhazen wrote more than 200 works on a wide range of subjects, of which at least 96 of his scientific works are known. Most of his works are now lost, but more than 50 of them have survived to some extent. Nearly half of his surviving works are on mathematics, 23 of them are on astronomy, and 14 of them are on optics, with a few on other subjects. Not all his surviving works have yet been studied, but some of the ones that have are given below. Alhazen was a polymath; the author of 90 works on topics as diverse as optics, vision, number theory, geometry, theology, astronomy, poetry, healing, and metaphysics. Many of his works, including the highly influential Book of Optics, were authored while he feigned madness to escape the wrath of Cairo’s caliph. Alhazen explained how the images formed in cameras are upside down, solved ‘Alhazen’s problem’ concerning the reflection of light from curved surfaces, and discovered a general method to find the sum of any integral power. He used this general method to discover the sum of fourth power positive integers and hence find the volume of a paraboloid. Abu Ali al-Hasan ibn al-Haytham was born into a Muslim family in about 965 AD in the city of Basra in the Buyid emirate, now in Iraq. Just as Mikolaj Kopernik is known by his Latinized name Nicolaus Copernicus in the west, al-Hasan’s name is often Latinized to Alhazen. Although a number of later artistic representations of him exist, we do not know what he really looked like. Alhazen became a government minister (vizier) in Basra and spent his spare time working on mathematics, writing a treatise on the ancient (and impossible) problem of squaring the circle. Alhazen believed in God. He weighed the differences between the religious sects around him in Basra, concluding that he favored the absolute, provable truths of mathematics and the philosophy of Aristotle to the conflicting claims made by the sects. In about 1000 AD, Alhazen left Basra for Cairo to work for its caliph, Hakim, who was a supporter of the sciences. The economies of Cairo and Egypt were dominated by the River Nile – agriculture was wholly dependent on its annual floods, but these had become increasingly unreliable. Alhazen believed he could make them reliable again by regulating the Nile’s flow with a dam. The caliph was excited by Alhazen’s plans and put him in charge of the project. 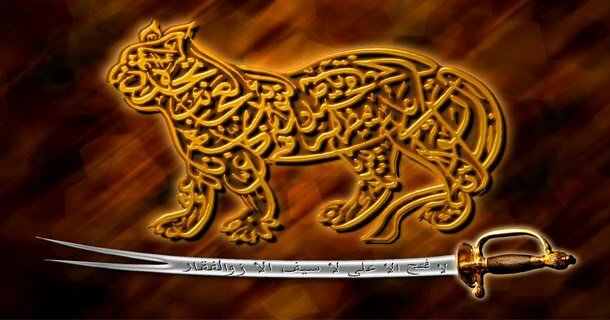 Unfortunately, Alhazen could not fulfill his promises, which terrified him, because the caliph had a fearsome reputation for punishing failure brutally. Alhazen feigned insanity and hid in a mosque. It seems Alhazen did some of his greatest work while taking refuge, including writing his famous Book of Optics. When the caliph died in 1021, Alhazen reemerged to enjoy about 19 years of freedom until his own death in Cairo in about 1040. Note: A different account from the physician Ibn Abi Usaibia of Damascus says Alhazen feigned insanity in order to be released from his work in Basra and go to Cairo. Alhazen personally acknowledged authorship of 90 books, of which 55 still exist. He immersed himself in the works of Ancient Greek scholars such as Euclid, Apollonius of Perga, Archimedes, and Ptolemy, seeking to use their writings as a foundation to build on. He made important contributions in the fields of optics and mathematics. Do Our Eyes Emit Rays? (A) Plato, Euclid, Galen, and Ptolemy promoted the idea that our eyes emit rays which land on objects allowing us to see them. They realized light is not really emitted by our eyes, it comes from luminous sources such as the sun. They used the eye ray theory to explain an number of puzzling problems – for example, you don’t see a small object on the ground even though you are looking at the general area it is in until rays from your eyes actually land directly on it. (B)Aristotle said our eyes do not emit rays. In the sixth century John Philoponussaid our eyes receive rays of light. He said air allows colors to pass through it without becoming colored itself. He supported this with his observation that a stained-glass window casts colors on floors and walls but does not color the air. In his great work Book of Optics, Alhazen correctly identified that our eyes do not emit rays. He argued that light affects the eye – for example we can damage our eyes by looking directly at the sun – but our eyes do not affect light. Moreover, he said that if we look at a bright object, an afterimage remains with us after we close our eyes. Again this suggests that our eyes have been affected by light. Otherwise, Alhazen supported most aspects of Galen’s incorrect assessment of how the eye works, such as the lens is the receptive organ of sight. Camera is a Latin word meaning an arched or vaulted room, while obscura means dark. In ancient times, different cultures discovered that a tiny hole in an external wall of a dark room allows images of the outdoors to form upside down inside the room, as shown below. The effect can also be seen in a pinhole camera, consisting of a dark box with a small hole in it. Alhazen carried out experiments with pinhole cameras and candles and explained correctly how the image is formed by rays of light traveling in straight lines. A pinhole camera produces an inverted image. Four centuries would pass before Leonardo da Vinci suggested that the eye is actually a camera obscura, a fact proven by Johannes Kepler after about another century. As we have seen, Alhazen was fascinated by light and vision. This led him to make an intriguing mathematical discovery that suggested a link between algebra and geometry. The link was later reinforced by Omar Khayyamand fully developed by Descartes and Fermat. An Ancient Greek book entitled Catoptrics compiled probably between the times of Euclid and Theon considered the behavior of reflected light and established the law of light reflection. A work by Hero of Alexandria made the assumption that light rays always take the shortest path between two points. Alhazen considered an observer and a mirror shaped like the inside of a circle. He pictured a ray of light arriving at the mirror from a light source. He asked the question: at what point on the mirror must a light ray arrive so that it is reflected into the eye of the observer? He sought to solve the problem for the light source and observer in any positions. This question became known as Alhazen’s Problem, and is often called Alhazen’s Billiard Problem. The behavior of a billiard ball is helpful in understanding Alhazen’s problem. Alhazen’s billiard problem: at which point on the circular side of the table must you aim the cue ball so that it hits the center of the red ball? 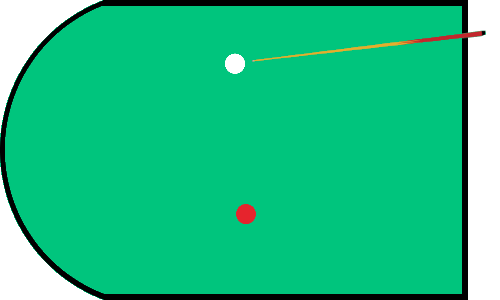 Solve the problem for the cue ball and red ball in all possible locations. By means of long, complicated geometrical arguments and proofs, Alhazen solved the problem by considering a circle’s intersection with a hyperbola. Alhazen discovered the formula for the sum of fourth powers when he took on the challenge of calculating the volume of a paraboloid. This is the 3D-shape you get by rotating a parabola around a flat base. 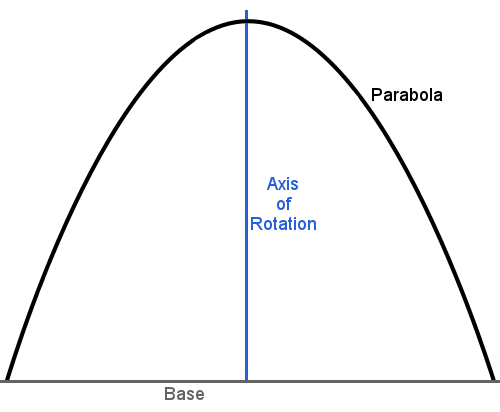 Rotating the parabola around the blue axis creates a hill-shaped paraboloid. Alhazen approached the problem in the way Eudoxus or Archimedes would have, by the method of exhaustion, summing slices of the shape. Archimedes had used this technique brilliantly to find the volume of a sphere. Alhazen applied the method of exhaustion to the paraboloid and found he needed the formula for the sum of fourth powers to calculate the answer. The formula for the sum of second powers had been discovered by Archimedes, and third powers by the great Indian mathematician Aryabhata. There was, however, no formula for the sum of fourth powers. Alhazen realized he would have to discover this for himself. And discover it he did. In fact, the method Alhazen developed to discover the formula was valid for any power, so he could have found the sum of the fifth power, sixth power, seventh power, etc.